PICTURED: Bill English regales media with tales of a “pretty crazy” night in. 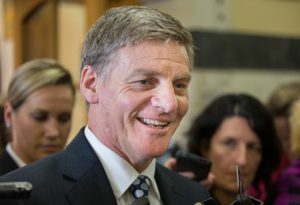 Incoming Prime Minister Bill English celebrated his ascension to the highest office in the land last night by cheekily knocking back twice the amount of Listerine he usually uses before his 10pm bedtime. English acknowledged that he may have gone a “bit wild” during celebrations last night, but said that everyone needs to let loose “sometime,” and yesterday was most certainly the occasion for it. The press pool laughed and jeered as English recounted his wild celebrations, which he acknowledged were not exactly becoming of a Prime Minister. “It’s a good thing I’m not one yet,” he quipped, before laughing at his own joke for 2 to 3 minutes. In addition to gargling an obscene amount of Listerine, English also recounted how he left his shoes on inside, and even had “a bikkie” with less than 5 minutes to go until bed. English was joined for his celebrations by Earthquake Recovery Minister Gerry Brownlee, who himself knocked back three full-size bottles of vodka and two McDonald’s $40 Mega Share Boxes.